Bonnie Devlin takes notes during a drum class with Frisner, circa June 20, 1981. Frisner was always quick to say that nobody taught him to play the drum. He learned as a youth in situ, sitting beside adult drummers during Vodou dances in Port-au-Prince. Of course, they were his teachers, but the tradition was collective and open, unlike the sober discipline of music lessons in the European tradition. After arriving in New York and tasting the bitter grind of factory employment, Frisner struggled for a career in music, and drum lessons offered a practical starting point. His lack of a model from past experience became a double-edged sword: confusing for students who needed the familiar structure, while mind-blowing for the more adventurous and imaginative. Frisner Augustin teaches Kathy Jackson (left) and Lois Wilcken at a class in Manhattan, May 1983. During the 1970s Frisner played Vodou dances in the immigrant community, and these put him in touch with dancers and drummers who performed on stage, principally for community festivals. Through their circles he picked up students. When I met him in 1981 he ran a Saturday drumming class from his tiny room on Manhattan’s Upper West Side. A few months later a friend and I arranged for a weekly class in her Lower East Side loft. He moved to another level when Hunter College established a weekly Haitian drumming workshop in its Music Department. From September 1983 until his passing in February 2012 Makandal’s Friday evening of drumming at Hunter was both workshop and social event. Frisner’s talent for teaching blossomed, and jobs followed. Credentials included a residency at University of Florida, and teaching artist positions with the Brooklyn Arts Council, City Lore, and the Carnegie Hall high school program. In an interview on March 12, 1999, in Brooklyn, I asked Frisner, in Creole, about his teaching methods. He called his first method pran san w, a Creole phrase translated literally as “take your blood.” Pran san w is a figurative way of saying, “Relax!” I translate it “Take your time” because anyone who took a class with Frisner knew that it was his first method. Oke, metòd mwen swiv pou m montre moun bat tanbou, premye metòd la se pran san w. Pran san w pou w kapab swiv ling sa w ap bat la. Paske nan leson tanbou a nou gen fè a pou nou respekte, nou gen bas la pou nou respekte, nou gen boula pou nou respekte, nou gen segon pou nou respekte, manman pou nou respekte. Paske yo chak fè yon bagay diferan. Se tout moun sa yo ki ansanm ki fè mizik la dwat. Donk, se sak fè m toujou di elèv yo pran san yo, piga yo twò vit. Okay, the method I follow in teaching people to drum, the first method is take your time. Take your time so that you can follow the line you’re playing. Because in the drum class we have the bell to respect, we have the bass to respect, we have the third drum to respect, we have the second drum to respect, the lead to respect. Because each does something different. Together they set the music straight. So that’s why I always tell students to take their time, don’t rush. On reflection, it becomes evident that for Frisner, taking your time was not a science of measurement but rather an art of discipline and patience: holding back and immersing yourself in one part before moving on to the next, resisting the temptation—all too powerful in a fast-food, fast-lane, fast-cash culture—to play the lead when you have yet to master the humble (but exceedingly crucial) bell, listening to your fellow musicians with an ear on the whole, and synchronizing with the dancers and singers. It was putting aside the fixation on what I am doing for what we are doing. One more item in closing: Frisner teaching a class of beginners at the New York Open Center in March 2009. The Frisner Augustin Memorial Archive, currently under construction, tells stories of the maestro as master teacher, master performer, and ountògi (sacred drummer). It tells stories, too, about the art of Vodou drumming at a particular time and place in its evolution. The Archive is for you, and for the students, scholars, and art lovers of the future. Won’t you help us with a tax-deductible donation? Many thanks in advance for your ongoing support. Header, detail from photo by Lois Wilcken: Bonnie Devlin takes notes during a Haitian drumming class with Frisner Augustin, circa June 20, 1981. 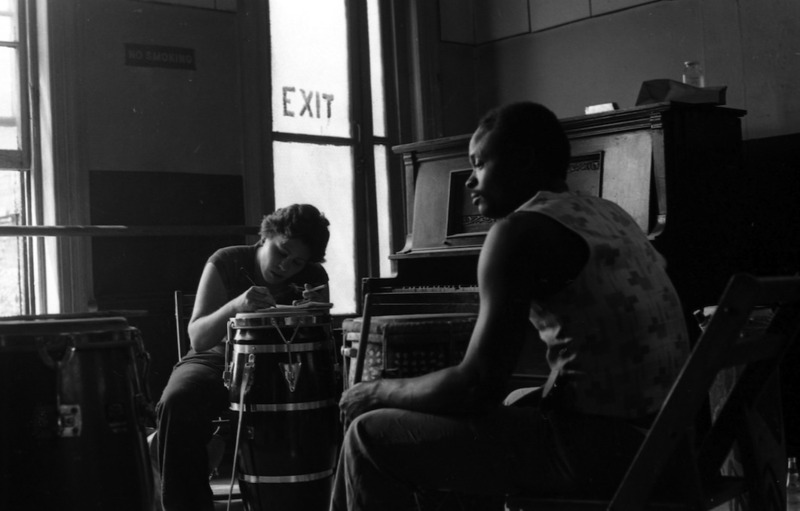 Photo by Lois Wilcken (second paragraph): Bonnie Devlin takes notes during a Haitian drumming class with Frisner Augustin, circa June 20, 1981. 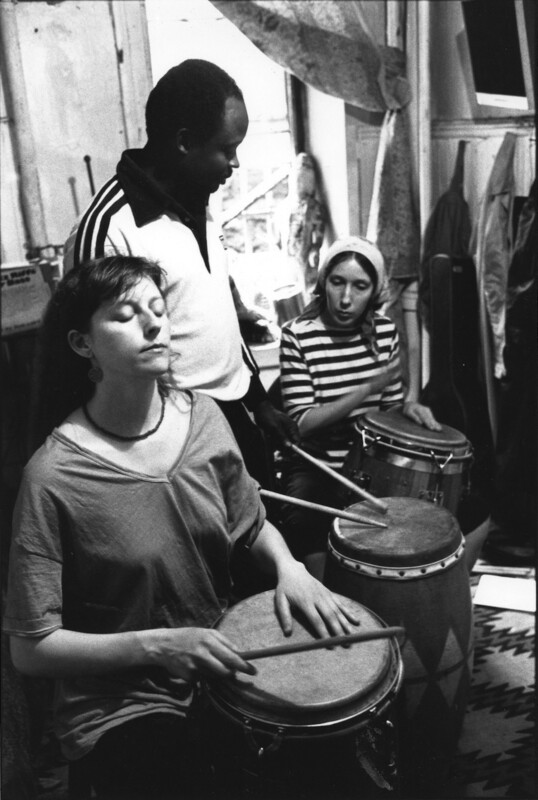 Photo by Chantal Regnault (third paragraph): Kathy Jackson (left) and Lois Wilcken take a class in Haitian drumming with Frisner Augustin in Manhattan, circa May 14, 1983. 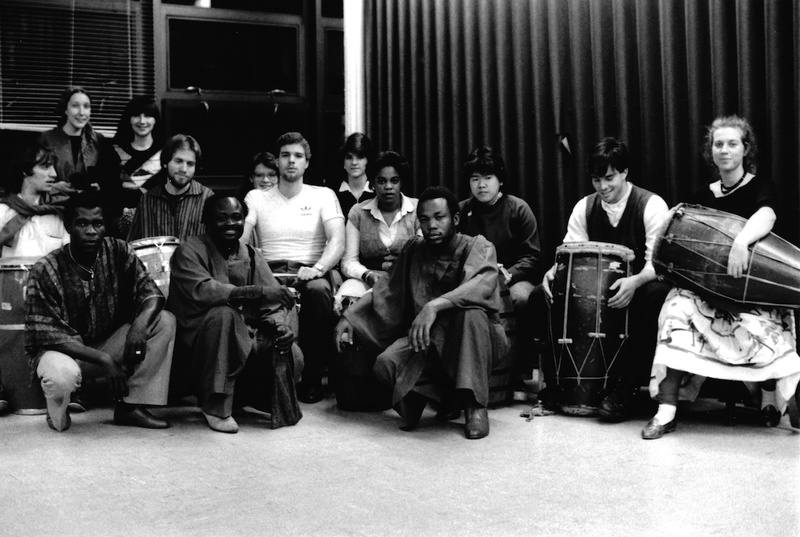 Photo by Chantal Regnault (above fifth paragraph): Frisner Augustin (bottom row, second from left) poses with the Hunter College Haitian Drum Workshop in its first semester, Manhattan, November 18, 1983. 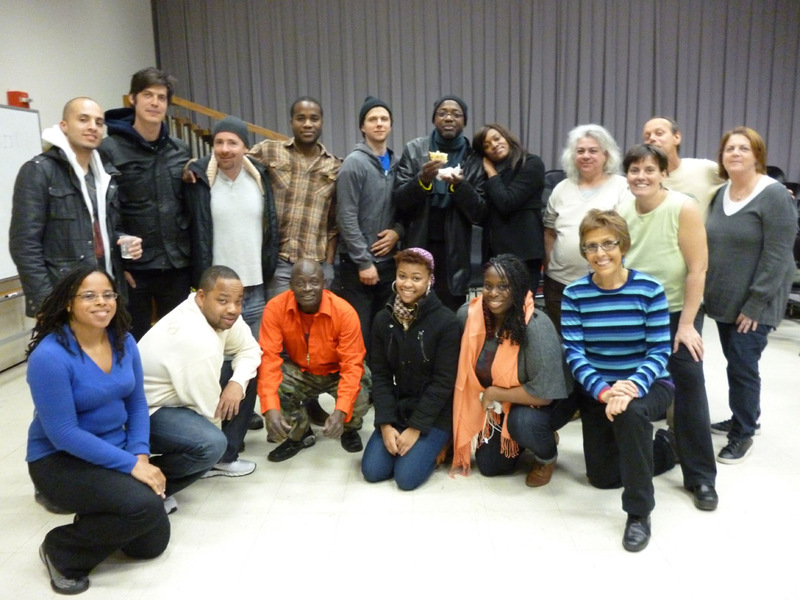 Photo by Lois Wilcken (above eighth paragraph): Frisner Augustin (bottom row, third from left) poses with the Hunter College Haitian Drum Workshop in his last meeting with it, Manhattan, December 26, 2011. Video by Jeremy Robins: Frisner Augustin teaches Haitian drumming at the New York Open Center, Manhattan, March 2009.